数据来源：The Kaiser Family Foundation, The U.S. Global Health Initiative: Key Issues, p.10. 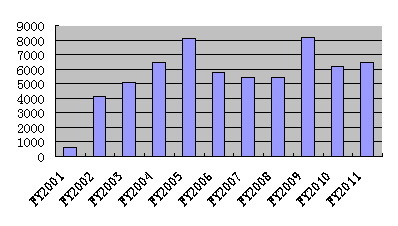 数据来源：The Center for Arms Control and Non-Proliferation, “Federal Funding for Biological Weapons Prevention and Defense, Fiscal Years 2001~2009,” April 15, 2008. 数据来源：Crystal Franco, Tara Kirk Sell, “Federal Agency Biodefense Funding, FY2010~2011,” Biosecurity and Bioterrorism: Biodefense Strategy, Practice, and Science, Vol.8, No.2, 2010, p.130.